The return system provides for all editing or amendments from the supplier’s side only. The recipient will have the option to reset/unlock or reject a document but editing of or amendment to the same shall be made by the supplier only. Details of the documents uploaded up to the 10th of the following month may be edited by the supplier up to the said date (10th day of the following month) only if such documents are not accepted by the recipient. If a document has already been accepted (up to the 10th) by the recipient, then such document has to be reset/unlocked by the recipient and only then, it can be edited by the supplier up to the 10th day of the following month. The details of the documents uploaded by the supplier up to the 10th day of the filing month or quarter will be auto-populated and made available to the recipient in FORM GST ANX-2 to accept, reject or to keep the document pending. 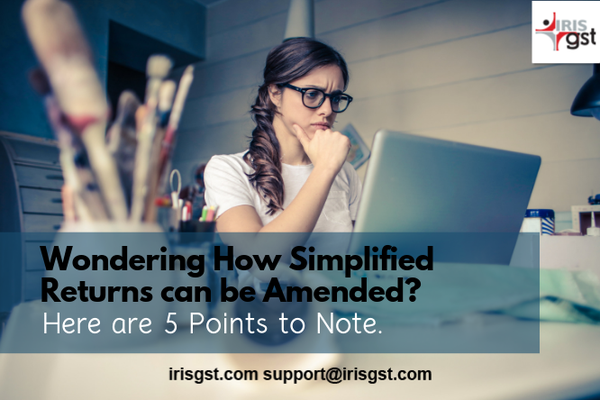 The supplier may edit the rejected documents before filing any subsequent return for any month or quarter. However, credit in respect of the document so edited or uploaded shall be made available through the next open FORM GST ANX-2 for the recipient. However, the liability for such edited documents will be accounted for in the tax period (month or quarter) in which the supplier has uploaded the documents. In certain situations, the particulars of the document may be correct but the document has been reported in the wrong table. Therefore, when the recipient rejects such documents, instead of amending the document, a facility of shifting such documents to the appropriate table will be provided. The documents relating to such supplies may be amended by the supplier at any time and the same shall not be dependent upon the action taken (accept/reject/pending) by the recipient. To know more about new and simplified forms, Sahaj and Sugam, read here.